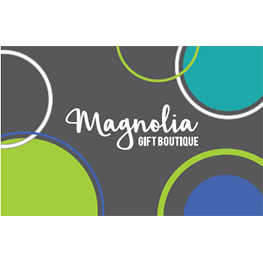 Located on Historic Main Street, Magnolia carries gifts for everyone! Decorating a table, a room, or making a house your home is one of life&apos;s greatest pleasures. You can transform your daily life, entertaining, and gift giving into an art form with the imaginative, fun, and unique products that big-box stores just don&apos;t carry. Magnolia does. We believe in "Celebrating the Everyday." Products include tableware, textiles, pets, infant/children, teenage/young adult, stationary, soaps/scents, jewelry, accessories, gifts, and more.